Under the Medicare program, the Centers for Medicare & Medicaid Services (CMS) and its contractors paid over $400 billion in Medicare benefits in calendar year 2006. GAO was asked to determine if Medicare providers have unpaid federal taxes and, if so, to (1) determine the magnitude of such debts, (2) identify examples of Medicare providers that have engaged in abusive or potentially criminal activities, and (3) determine whether CMS prevents delinquent taxpayers from enrolling in Medicare or levies payments to pay taxes. To determine amount of unpaid taxes owed by Medicare providers, GAO compared claim payment data from CMS and tax debt data from the Internal Revenue Service (IRS). In addition, GAO reviewed policies, procedures, and regulations related to Medicare. GAO also performed additional investigative activities. Our analysis of data provided by CMS and IRS indicates that over 27,000 health care providers (i.e., about 6 percent of all such providers) paid under Medicare during calendar year 2006 had payroll and other agreed-to federal tax debts totaling over $2 billion. The $2 billion in unpaid tax debts only includes those debts reported on a tax return or assessed by IRS through its enforcement programs. This $2 billion figure is understated because some of these Medicare providers owed taxes under separate tax identification numbers (TIN) from the TINs that received the Medicare payments or they did not file their tax returns. We selected 25 Medicare providers with significant tax debt for more in-depth investigation of the extent and nature of any abusive or potentially criminal activity. Our investigation found abusive and potentially criminal activity, including failure to remit to IRS payroll taxes withheld from their employees. Rather than fulfill their role as “trustees” of this money and forward it to IRS as required by law, these Medicare providers diverted the money for other purposes. Willful failure to remit payroll taxes is a felony under U.S. law. Furthermore, individuals associated with some of these providers at the same time used payroll taxes withheld from employees for personal gain. Some of these individuals accumulated substantial wealth and assets, including million-dollar houses and luxury vehicles, while failing to pay their federal taxes. In addition, some providers received Medicare payments even though they had quality-of-care issues, such as losing track of a patient in their care who has not been found. CMS has not developed a policy to require contractors (1) to obtain consent for IRS disclosure of federal tax debts and (2) to screen providers for unpaid taxes. Further complicating this issue, absent consent by the taxpayer, which CMS does not require, federal law generally prohibits the disclosure of taxpayer data to CMS or its contractors. IRS can continuously levy up to 15 percent of each payment made to a federal payee–for example, a Medicare hospital–until that tax debt is paid. However, CMS has not incorporated most of its Medicare payments into the continuous levy program. As a result, for calendar year 2006, the government lost opportunities to potentially collect over $140 million in unpaid taxes. As federal deficits continue to mount, the federal government must take all effective measures to collect the billions of dollars of unpaid taxes. Because payroll taxes fund the Medicare program, Medicare providers should especially pay their fair share of taxes owed, especially payroll taxes. However, with respect to the continuous levy program, the federal government continues to fail to reach its potential. A substantial amount of Medicare payments to delinquent taxpayers will continue to go uncollected until CMS can establish a process to incorporate its payments into the continuous levy program. The failure to enforce tax laws against Medicare providers has a detrimental affect on compliance. As America ages, the GREED factor related to Health Care grows exponentially. Services provided are watered down and cost is inflated to squeeze every penny out of the US Taxpayer. Health Care is no longer the realm of humanitarian motives. Health Care is BIG BUSINESS with roots in Pharmaceuticals and Hospital Corporations. The argument for and against the medical industry under government control has its benefits and drawbacks. The most glaring Benefit is oversight (Drawback: if America can ever get that concept to work), for service the medical system provides. This is not the “Socialized Medicine” that corrupt Medical Businesses would like you to believe. This is a cap on the outrageous price fixing they have enjoyed for too long. There are too many examples to cite for price fixing … just ask yourself why patients have traveled to other countries to get affordable treatment. The Medical Industry has lost its way. The US Government has victimized taxpayers by lining their pockets with kickbacks from their “Golden Goose”. The US Taxpayer has funded too much fraud and waste in general. But, when it comes to basic health care, the US Taxpayer is out of luck. Corrupt business has marketed the fear of “Socialized Medicine” so well, that self-serving semantics have re-defined the whole concept of medical oversight. The most glaring omitted information from Russert’s doctor is telling us what diabetes medication he was taking. I am willing to bet that he was taking Avandia, the drug the FDA should have pulled off the market because it causes a whopping 43% increased risk of a sudden heart attack, information the FDA actively sought to sequester during that drug’s approval process. Why do I think that? 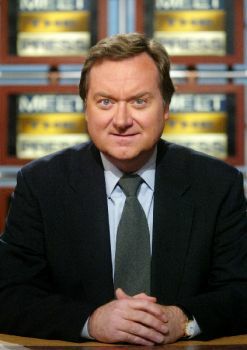 Because in the scant health data his doctor is giving out he has stated that Russert had high triglycerides and low HDL cholesterol – the exact metabolic profile that Avandia is supposed to treat. When a treatment has death as a common side effect it can hardly be considered a treatment. Could it be that Russert is a casualty of one of the great Big Pharma/FDA scams currently going on? How ironic, since all news programs are sponsored by this industry’s ads and the media fought tooth and claw in the past year to ensure that dangerous drug ads could continue to run non-stop during all news programs – exposing millions of Americans to drug-induced injury (while they got their billions in ad revenues). I am stunned that no reporter interviewing his doctor seems to be able to ask such an obvious question.